Poultry veterinarians are small animal medical practitioners who specialize in poultry medicine and management. They are licensed animal health professionals with advanced training in the management of poultry species such as chickens, turkeys, and ducks. 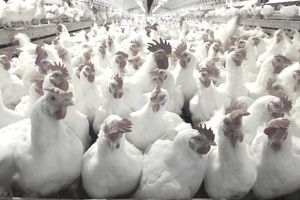 Typical duties for poultry veterinarians include providing basic examinations, observing flock behavior, giving vaccinations, conducting inspections, evaluating meat or eggs, taking samples for analysis, making nutritional recommendations, and devising flock health management procedures. It is not uncommon for poultry vets to work fairly regular hours within a five to six day work week, especially once they have an established practice with regular clients/patients. Poultry veterinarians can focus on a particular species of interest (chickens, ducks, or turkeys) or on a specific type of production (eggs or meat). They can also transition into general avian practice or companion animal practice, work as veterinary pharmaceutical sales representatives, or move into regulatory inspection roles. Poultry veterinarians begin by completing a Doctor of Veterinary Medicine (DVM) degree, which is achieved after a comprehensive course of study in both large and small animal medicine. After graduation, new vets must pass the North American Veterinary Licensing Exam (NAVLE) to become eligible for licensing. After completing the DVM degree, a vet seeking board certification in the poultry specialty must pursue additional training through a residency, publish articles relevant to poultry medicine, and seek out sponsorship by current board certified poultry veterinarians. The American College of Poultry Veterinarians (ACPV) administers the certifying exam for poultry medicine in the United States. The board certification exam for poultry medicine consists of three parts: projected images, multiple choice questions, and a written practical test. As an additional educational option, the University of Georgia offers a Master of Avian Health and Medicine (MAHM) degree for veterinarians. This non-thesis degree program is offered completely online and is recognized by the American College of Poultry Veterinarians (ACPV). The Association of Avian Veterinarians (AAV) is one of the largest professional organizations focusing on avian medicine and publishes the well-known Journal of Avian Medicine and Surgery. The AAV hosts a prominent national conference annually that is attended by many industry leaders. The international division of the AAV is known as the European Committee of the Association of Avian Veterinarians (EAAV) and has members hailing from Europe, Dubai, and Northern Africa. The World Veterinary Poultry Association (WVPA) is an international group specifically dedicated to poultry medicine. The WVPA hosts a global conference every two years. According to data from the Bureau of Labor Statistics (BLS) the veterinary profession will show growth at approximately 12 percent through 2022, which is approximately the same as the average for all professions. The BLS had previously predicted growth at a much stronger rate, but that projection has been reined in due to the increasing number of graduates and a flattening demand for services. Prospects may still be strong for poultry practitioners due to the limited number of board-certified specialists in the field.